Our school failed to make it to the basketball finals of the Philippines' National Collegiate Athletic Association (NCAA). :-( If you have read my previous post, you know how much I was a big basketball fan in my younger years. 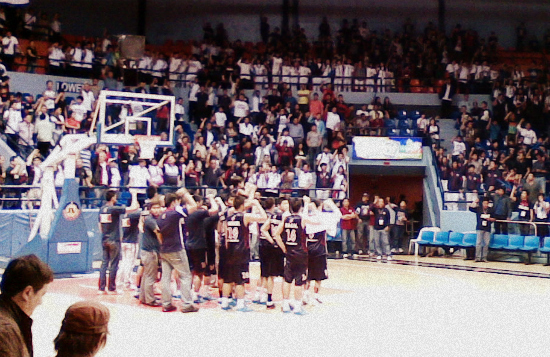 Though I failed to watch our basketball games over the past years, my interest and support to our team never ceased. Next year, our school will be the host of the league's 88th season. And though I don't have any Chinese blood, I believe in the luck that number 8 brings. For the Chinese, the number 8 symbolizes a never ending loop of luck. I hope that luck will be with us next school year. The burger is good but I appreciated more their unique spicy french fries and special iced tea. Another shot for the lethal weight gain combo! Wink! I love the cute packaging. Have a great week to everyone! It is just a game .Some lose .Some win. Is 8 number lucky ..?Well ,I reckon lucks depends on many factors. Thanks for your comment .It is my plaseaure to follow your blog. Iam sorry your team lost, DIane, but isn't it nice to have friends who can cheer you up when you're sad!!! So sad about the loss. I know exactly how you feel, we get so personal when it comes to sports like sometimes it feels more like it's just a game loss. That cup is super fun. We never get cups like that here! You guys eat the best foods on your outings! Sorry about the loss next time! Sorry your team didn't make it to the finals, but I'm sure they gave it their best. Always next year, right? Your food pictures always make me so hungry. I sorry, your team did not make it to the finals. I wish them good luck next season. Your food looks yummy. Great photos, have a wonderful week! And now I am hungry! Losses are a part of life, they make you appreciate the wins even more. Hi Diane and I'm sorry about your team! I'm sure they did the best they could and lots of support was given. The food looks wonderful. Now you've made me hungry! We all need to have a naughty smile every now and then, right? The spicy fries, mmmmmm right up my alley. 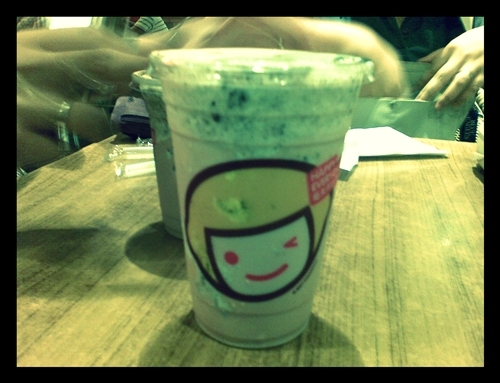 I have never heard of milk tea. Sounds very interesting. Sorry that your b.ball team didn't make it. My hubby played alot of b.ball when he was younger. I loved watching him. He could jump very high. Now were both lucky if we can get off the ground when we jump. lol! Couldn't be because we love to eat too. p.s. Would love to have you come and visit anytime. It would be so fun showing you our country. Sorry about the loss, but the food must have been a comfort. Sure looks good! I have a confession, I haven't tried "Happy Lemon" yet, and I feel like I'm such a loser! 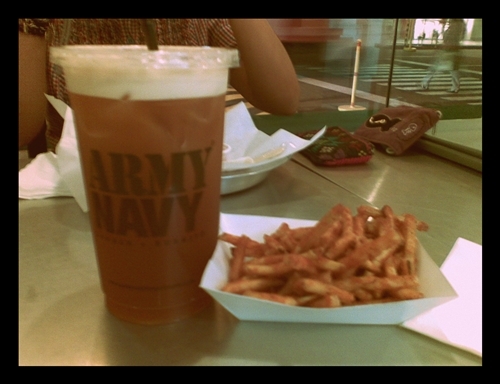 Army Navy is good and cheap, that's why it's perfect! 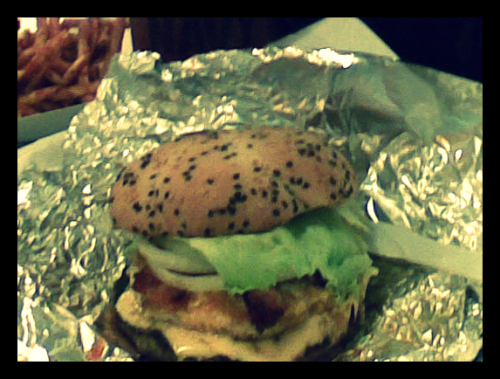 ohh the fries look too good.